Well done to everyone who passed their Silver and Gold tests today, and those who were successful in the Bronze last week. For those that didn't manage it this time, keep at it and good luck for the next test. If you have any questions, news, or items you would like posted, you can email them via the link below. 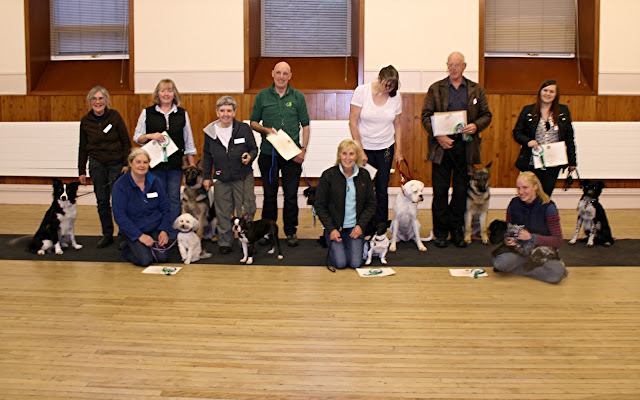 We are a Kennel Club registered club holding classes in St Thomas's Hall, Keith on Tuesday evenings. Ringcraft 6.30-7.15pm, Puppy 7.15-8pm, Bronze Good Citizen Dog Scheme 8-8.45pm, Silver and Gold Good Citizen 8.45-9.30pm. £2 per dog per class. New members are always welcome. The club is run by a committee of volunteers, none of the trainers receive any payment. Any profits made go back into the club and regular donations are given to charity. As part of the test, owners are required to carry a poop scoop and also make sure that their dog wears an identity disc. We would like to point out that BY LAW the disc should show the owner's name and address, anything different will result in the dog failing the test. Phone number and postcode are optional but not required by law.